Piebald and skewbald are British terms for particular color combinations on horses’ coats. These terms describe the horse’s coloration and external markings only, not its breed or genetic makeup. In addition to coloration, registration authorities also recognize particular patterns of markings. According to the British Skewbald and Piebald Association, a horse registered as piebald or skewbald ideally has a 50-50 distribution of two colors. Piebald horses have large, irregular patches of black and white on their coats. Skewbald horses, on the other hand, have a combination of white and any other color -- typically brown, chestnut or bay. Both piebald and skewbald horses should have white markings that are continuous over the color base. 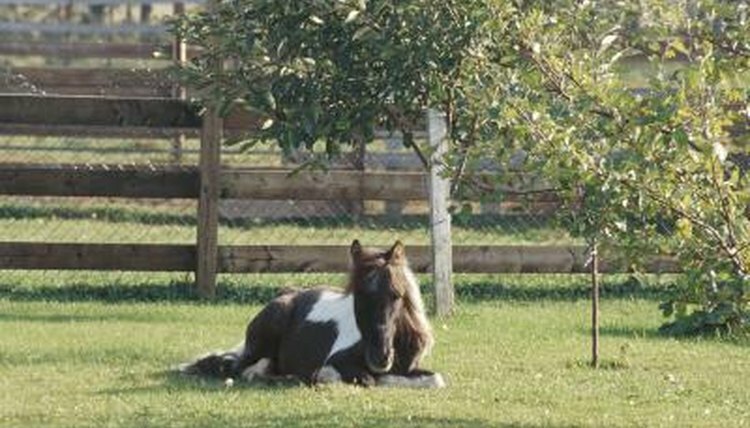 The term pinto is used in the United States to describe horses with white patterns; it can apply to any breed. An American paint horse is a pinto with either a thoroughbred or quarter horse bloodline. The tobiano coloration, which comes from a dominant gene, is perhaps the most well-known color pattern for piebald and skewbald horses. Tobiano horses usually have white legs, a solid colored head and brown eyes. According to the BSPA, tobiano horses look as though a bucket of paint has been poured over a white horse from above. Unlike overo patterns or tovero patterns, the tobiano classification refers to a single distinct pattern. Overo patterns, genetically recessive, may occur in foals with two solid-color parents who are carriers of the gene. Several coloration patterns are recognized as overo patterns, and a piebald or skewbald horse may display characteristics of more than one of these patterns at once. One overo pattern is called a frame because it looks as though the horse’s white spots are surrounded by a colored frame. Other overo patterns include sabino and splashed white varieties. The BSPA distinguishes overo patterns from tobiano patterns: Overo-patterned horses look as though they were dipped in paint from the underside up. Tovero-patterned horses display a combination of both tobiano and overo color pattern traits and genetics. Tovero horses have colored markings on a white base and typically have at least one blue eye. Although tobiano and overo patterns have specific genetic markers, no known tovero gene exists. Tovero is simply a word to describe the horse’s color pattern. Horses with such patterns typically have a significant amount of white with relatively little coloration.